After a very successful few years in Division II, the Lady Avengers basketball team was ready for a challenge facing the top teams in the state. It was a realignment year and after their previous winning record, the Avengers were competed this year in Division I. 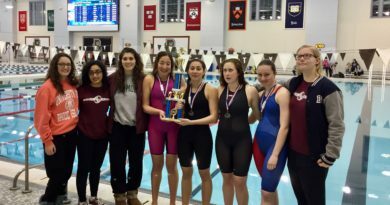 The team was led by two senior captains, Courtney McMullen and Sofia Ruggeri. Junior captain, Hannah Burke, missed half of the season due to a concussion, leaving the Avengers with a very young team. Sophomores, Chloe Moss and Julia Matus, were consistent contributors to the Avenger offense and freshman Skyler Sullivan also added her fair share of points. However, the Avengers’ strong defense was what really allowed the girls to compete in most games. 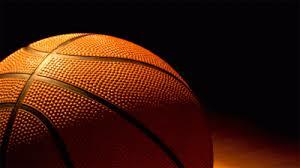 Although they finished with a record of 7-11, the team made great progress and improved as the season progressed. 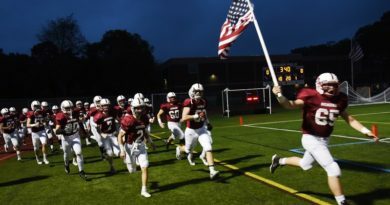 As one of the smallest schools in Division I, they knew competing with the top private schools in the state would certainly be a challenge, but the Avengers were prepared to rise and accept. Unfortunately, the Lady Avenger’s season ended rather quickly after falling short to Cranston East in a preliminary round of the Division I tournament.